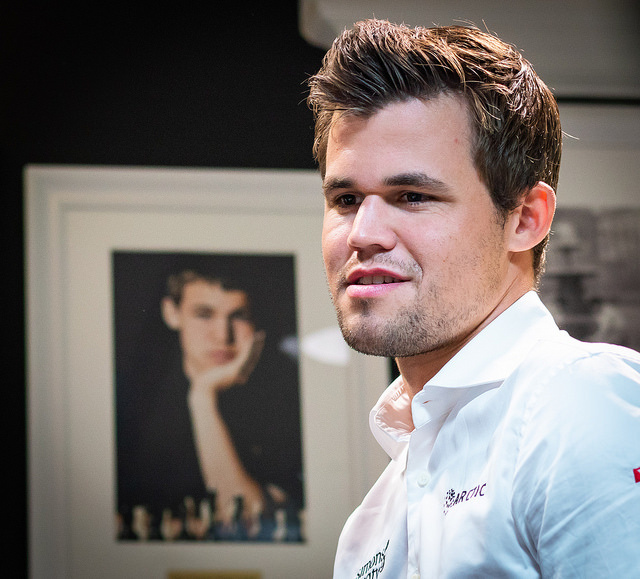 World Champion Magnus Carlsen will play Black against Maxime Vachier-Lagrave today as the 2018 Sinquefield Cup starts in St. Louis. 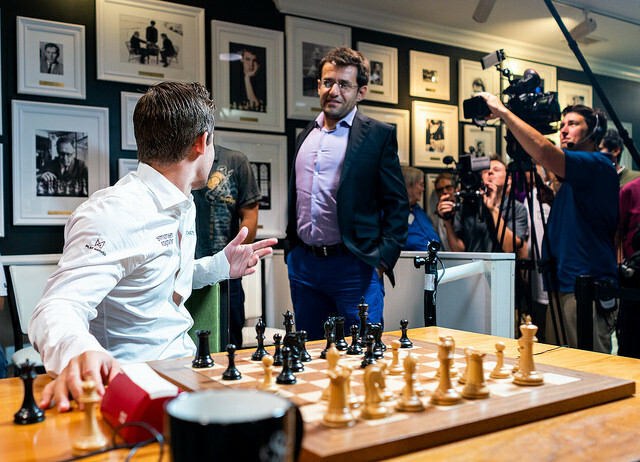 The Norwegian had already made it to the city for the Ultimate Moves exhibition, where the emphasis was all on fun, but at the opening ceremony for the main event there was tension as Caruana responded to what he perceived as trash talk with, “I think the last few months I’ve generally won tournaments in which Magnus is playing!” It’s clear the last classical event before their match means something to both players. 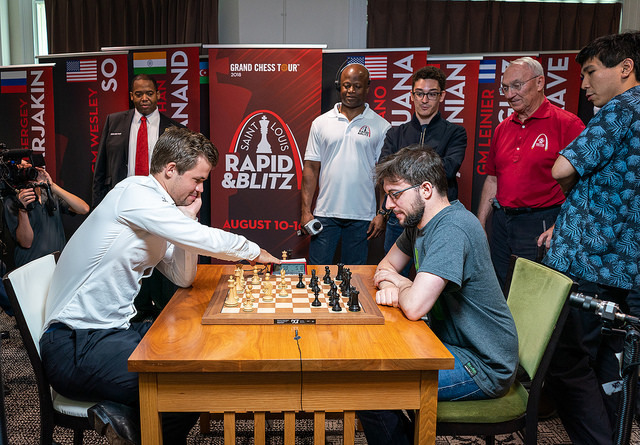 You can watch all the action live with commentary in English (Jennifer Shahade, Yasser Seirawan and Maurice Ashley), Russian (Peter Svidler and Evgeny Miroshnichenko) and Spanish (David Martinez). For the best viewing experience (no ads, unrestricted chat, full access to the instant database and opening book, cloud engine analysis of any move you make on the live board) as well as access to hundreds of hours of exclusive videos and much more, now would be a great time to Go Premium. Only during the tournament if you use the voucher code SINQUEFIELD2018 while purchasing a $/€99 1-year Premium Membership you’ll get 3 months extra free – which works out at just 6.60 per month! Magnus is the World Champion and any tournament that he’s not in generally is not viewed in the same way as a tournament that he competes in. If you can play in a field with Magnus and win a tournament it’s very special, so I think it’s going to be a very interesting event and yes, Magnus is the best right now, so I think we’ll all just do our best and try and finish ahead of him! It’s been a long time coming. I won the first one and then I haven’t since, so I hope to do better this year, and I don’t see any reason why I shouldn’t! As Jeanne and Rex have pointed out several times to me, there are no repeat winners so far, so I’d like to maintain that tradition, and hopefully it will be me! Last year I managed to be the first one to win the World Cup twice, so I think that’s a good tendency! Maxime Vachier-Lagrave mused, “I have very sweet memories of last year, and they say the second time tastes even better than the first”. Shakhriyar Mamedyarov commented, “I don’t think about results because Carlsen’s here”, though that should be taken with more than a pinch of salt given Mamedyarov is fresh from winning Biel ahead of Magnus! The most bland answer came from Sergey Karjakin, who began, “Of course I will try to do my best”. 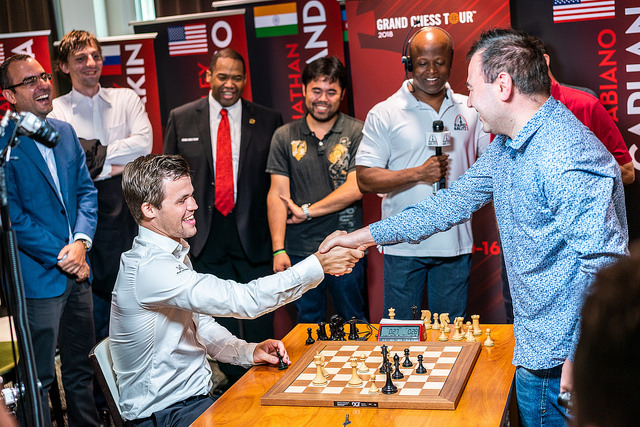 When Maurice Ashley then mentioned that Alexander Grischuk was, “not necessarily considered a favourite to win this event” it set up the perfect trolling opportunity! Grischuk even got to do a literal mike drop at the end. Maurice Ashley: Does a victory here mean anything as far as London is concerned? Magnus Carlsen: Well, not for me, but I think Fabi needs to win the tournament to get to London… being the Grand Chess Tour final, not the World Championship final. Magnus Carlsen: I didn’t mean to trash talk, I meant to just state something factual. But no, obviously he’s proved many times that he can win tournaments with me in them, so that was not a point at all. Grischuk: Either myself or no-one. I cannot envision anyone else starting on this job. Karjakin: I want that Giri will write a book about me. That would be my dream… because he likes trash-talking very much and he would say so many funny things. It will be brilliant. 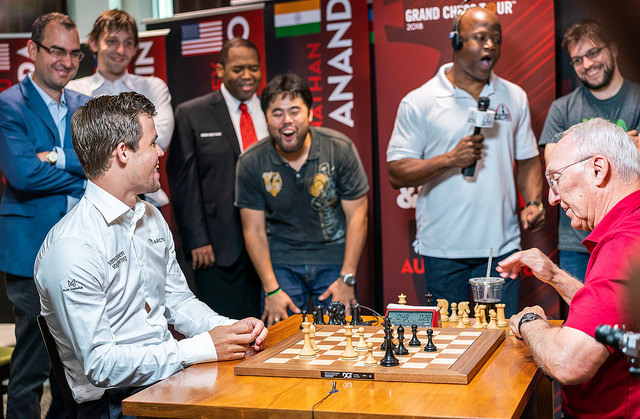 Carlsen: Nah, I mean, I don’t care… Like, I probably wouldn’t read it anyway! 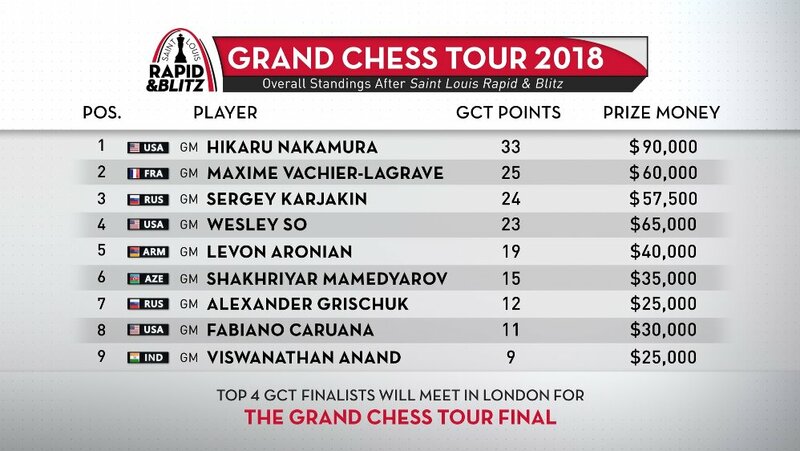 So (after Nakamura had already said Kasparov): If Garry ever writes a book about us it will be called, “My Great Successors”. Aronian: “I think if Garry would write a book it would be called ‘Inglourious Basterds’”! No-one watches the event for its chess content, though, so you really have to see the live show to relive the action! We want to make it clear that the score reflects the real difference in the quality of the teams. We’re lacking a pawn – the structure is generally better the less pawns you have! Maurice: Levon’s trash-talking didn’t affect you? Peter: I have met him before! Will he play the Hippopotamus against Maxime Vachier-Lagrave in Round 1? We’ll soon find out. 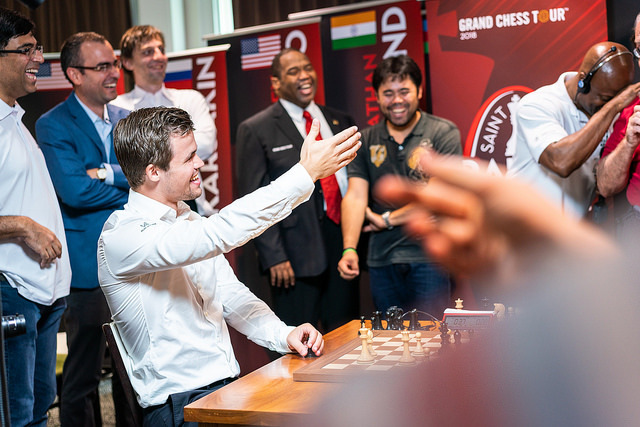 Watch all the action live here on chess24 from 13:00 local time (20:00 CEST)!